LIVE products are DIY products where you receive portfolio updates during LIVE market on a Fri afternoon and you can execute your self in your own accounts. The minimum capital recommended here is 5L and above. The products are Mi25 for smallcap, Mi30 and Mi40 for CNX500 , and Mi50 for small and midcaps. We also run a dual portfolio charity product Mi_LRHR. More details can be found below. Mi25 is a subscription based service and suits portfolio size of around INR 5-15 lacs approximately. It is primarily focused on small cap stocks listed on the NSE. Mi30 is a subscription based service and suits portfolio size of around INR 5-25 lacs approximately. The salient distinguishing feature here is the CNX500 universe of stocks that ensure better quality and depth of the stocks. Also the diversification is wider and the volatility is expected to be low. Mi50 is a flagship product of Weekendinvesting. It was initiated in Apr 2016. It’s first year report can be seen here. The services offered for Mi50 are to help you run a up-to 50 stock portfolio along with me. The momentum Type B logic used here is different from Type A in Mi25 and Mi30 as in the late matured entry vs an early entry in Type A. This reduces the returns a bit but also results in a much lower churn as strike rate of success is better.This service suits portfolio allocations of INR 50 lacs onwards. You can do a step-up of 25Lacs to enter. The portfolio changes will be once a week on Fri and hence only a 5-10 min time allocation per week is needed here. The advisory billing is raised at the end of each quarter based on performance. Please email me if you are interested in this strategy. 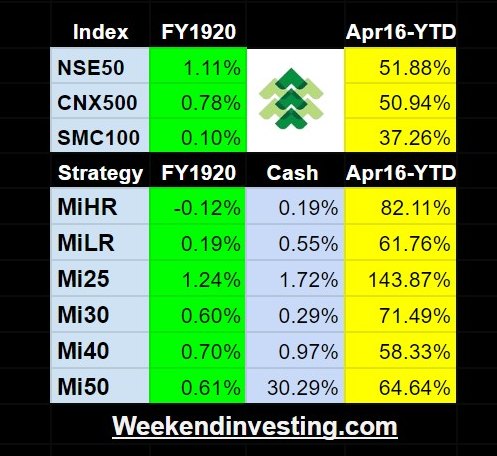 Mi40 is a weekly timeframe product of Weekendinvesting based on CNX500 stocks . It was initiated commercially in Oct 2017 though it was running in my portfolio since long. The services offered for Mi40 are to help you run a 40 stock portfolio along with me. The portfolio will run in your own account one on one guidance. The momentum Type B logic used here is different from Type A in Mi25 and Mi30 as in the late matured entry vs an early entry in Type A. This results in a lower churn and follows longer trends longer. As a result the returns are also a bit moderated and the drawdowns are a bit steeper too. This service suits portfolio allocations of 50 lacs to INR 5 Cr. You can do a step-up of 25Lacs to enter. The portfolio changes will be once a week and hence only a 5 min time allocation per week is needed here. The advisory billing is raised at the end of each quarter based on performance. Please email me if you are interested in this strategy. Disclaimer: I am invested in all the products myself. I also invest and trade several other strategies that may overlap or be contrary to these products. You may contact me on email Alok@WeekendInvesting.com for any queries.